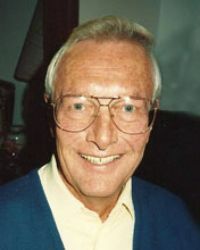 Bill passed away peacefully in Carman Memorial Hospital June 25, 2012 in his 82nd year. He leaves to mourn his passing his loving wife Gladys, three sons Jim (Susan), grandchildren Cory & Tessa, Susan's children Chris and Jesse, Ontario, Ken (Cathy), Cathy's daughter Lisa, Florida & Bill (Brenda), Brenda's son Braiden, Alberta, Brothers-in-law Ray, Frank & Fred (Rita), Sisters-in-law Margaret, Violet, Ida (Ernie)Theresa, Agnes & many neices, nephews & cousins. David, his first wife Lois, Brothers-in-law Don, Harold, Bob & Bill & a sisters-in-law Maureen & Marie. Carman, MB. He received a Builders Award from the Manitoba Chiropractors Association. Cremation has taken place with a private family ceremony at a later date. In lieu of flowers donations may be made to the Manitoba Lung Association.